Keep your Journey Wheel or Charkha case looking great with Wood Beams! No volatile organic compounds (VOCs) — good for wood, for you, and for the environment. Rub on, wait a bit, and then buff with a soft cloth to a satin finish. Wood Beams works wonders on all woods, and is even food-surface safe. Try it on knife handles, butcher blocks, fine wood furniture, and our favorite use — spindles, spinning wheels, and all wooden fiber tools! 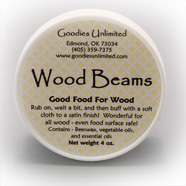 Wood Beams contains pure vegetable oils and real lemon and lavender essential oils. We like this product’s clean fresh scent. 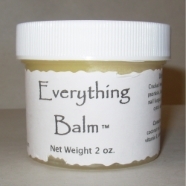 If you like Wood Beams for your wheel or spindles, you’ll love Everything Balm for your hands! It soothes, moisturizes and pampers your hands (and your feet, too). With beeswax, moisturizing and conditioning oils and butters, and tea tree and other essential oils. Your hands (and feet) will thank you — smells great too!